Dining out • Straight-forward dishes continue to satisfy in this casual, popular joint. Leah Hogsten | The Salt Lake Tribune&#xA;&#xA;Regulars crowd The Park Café in Salt Lake City for straight-forward, ample breakfasts, brunch and lunch-like French Toast Foolishness, huge omelets, Michigan Hash and patty melts. 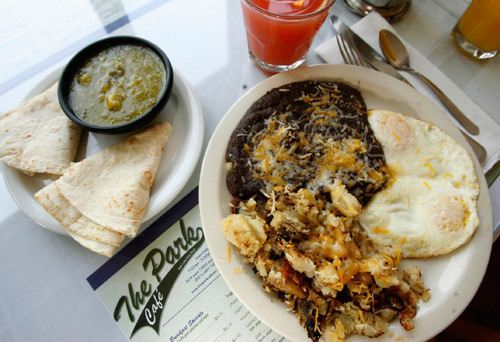 Leah Hogsten | The Salt Lake Tribune&#xA;The daily special of Sam's huevos rancheros at The Park Cafe in Salt Lake City. Leah Hogsten | The Salt Lake Tribune&#xA;&#xA;Regulars crowd The Park Café in Salt Lake City for straight-forward, ample breakfasts, brunch and lunch -- like French Toast Foolishness. Leah Hogsten | The Salt Lake Tribune&#xA;&#xA;&#xA;Regulars crowd The Park Café in Salt Lake City for straight-forward, ample breakfasts, brunch and lunch --like French Toast Foolishness, huge omelets, Michigan Hash and patty melts. 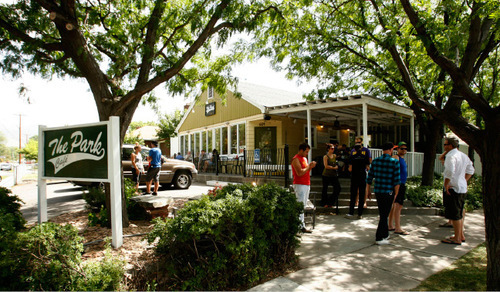 Leah Hogsten | The Salt Lake Tribune&#xA;&#xA;Regulars crowd The Park Café in Salt Lake City for straight-forward, ample breakfasts, brunch and lunch -- like Michigan Hash. 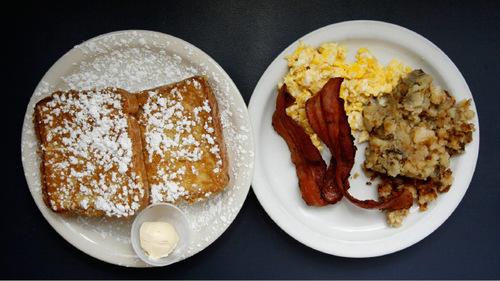 Leah Hogsten | The Salt Lake Tribune&#xA;&#xA;Regulars crowd The Park Café in Salt Lake City for straight-forward, ample breakfasts, brunch and lunch -- like French Toast Foolishness. The herd mentality makes even the hungriest of beasts  homo sapiens, for instance  well-mannered, patient creatures. That is most easily observed at restaurants habitually crowded with regulars and acolytes. They jostle for parking, find the all-knowing leader with the clipboard, give their vitals, and leave with a vague timeframe and the promise of a hearty meal. I've witnessed normally impatient personalities smile happily and step back out onto the curb among the throngs and wait anywhere from 20, 30, even 45 minutes for a table. For some reason, this routine is acceptable when it comes to the weekend brunch ritual. It's almost a given, especially if the place is good. The only instance where the ritual didn't go according to plan was when the diner was severely lacking his morning caffeine. His grumpiness spread like a virus in the sunny waiting area. If this person had been waiting at the Park Café, just south of Liberty Park, they would've had the caffeine at a moment's notice from an urn placed prominently by the door. I assumed it was for the staff to refill diners' mugs, but when I noticed a table-less patron help himself to a refill, I recognized it as a genius anger management tool for potential Sunday morning mobs. The Park Café has undergone many alterations under various owners, while the current offering presents its best face yet. The small and sunny restaurant doesn't overhype or overpromise. In fact, it's actually loyal regulars with hyperbolic word-of-mouth or online endorsements that take it a bit far. Still, the venue satisfies with straightforward breakfast and lunch options, quick-paced service, and a revamped ambience that allows diners to take in the sun and a bit of vibrant local art. 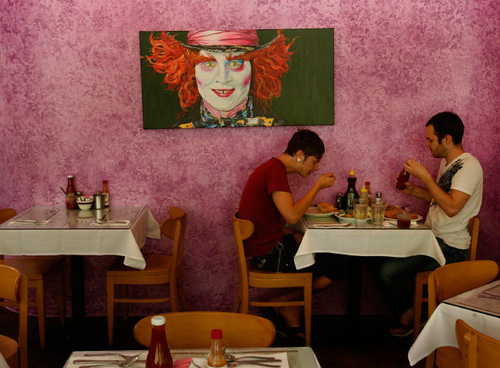 By far, the café is most crowded on weekends for breakfast and brunch. If you want to experience quieter charms, head over during weekday lunch times. No crowds, same quick service, and the same menu. Yes, the café serves breakfast until closing at 3 p.m. It would be a shame to miss the burgers ($4.95 to $5.95) and patty melt ($5.75), though. Both feature one-half pound ground sirloin. The bacon burger is less greasy than others in town, but it's a huge undertaking. If you order mushrooms (50 cents) with it, be warned: They will tumble out. The patty melt's square pieces of toasted rye can barely contain the beef and cheese and mushrooms. It makes for a decadent, if fairly grotesque, midday meal. More genteel diners can always opt for a turkey sandwich. Park Café's crowds know a good thing  breakfast is the short menu's strength, and Park Potatoes ($2.25 as a side) are the starchy bedrock. This house specialty comes heaped on the plate, the potatoes steamed, bronzed and well-seasoned. It's the sort of food people desire when they are famished or hung-over. 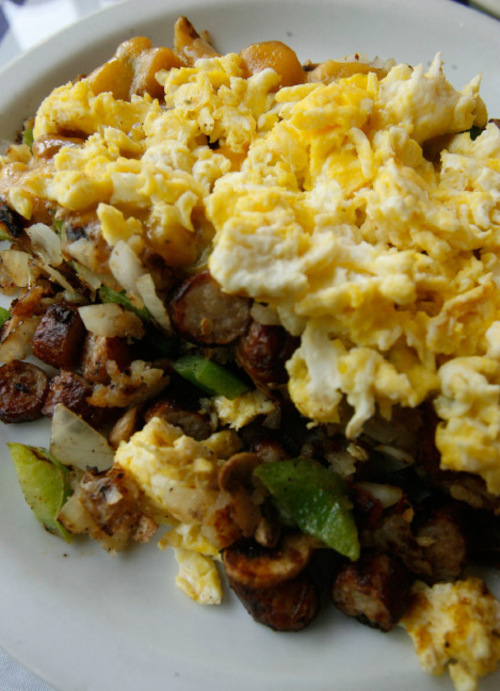 As a component to Michigan Hash ($6.75), it adds bulk to sausage, onions, mushrooms and peppers. The final accessories are the tangle of melting cheddar and a side of eggs. For anyone who likes taking food home in a doggie-bag, this is a good dish to re-heat later. Within minutes of ordering, pancakes and omelets arrive on overflowing plates. The Odelay omelet ($7.25) presents the same mélange as the Michigan hash, only with the potatoes on the side, versus meshed in with the scrambled, formed eggs. The pancakes are standard, and they're well served when dressed with the squeeze-bottle faux-maple syrup we all grew up with. For as popular as the venue is, it doesn't seem to take itself too seriously. The cafe's casual vibe is appealing and refreshing, compared to other breakfast temples that seem to revel in rubbing our faces in smug attitude. White walls, big bold pieces of art including side-by-side portraits of Jay-Z and Jimi Hendrix, reflect abundant sunlight. More problematic is the spacing between tables, which is cozy, to say the least. Servers who look as if they just came from the skate park or Liberty Park's drum circle do a marvelous job of weaving between folks and keeping water and coffee full. As a waiting diner, I appreciated their quick pace and turnaround. But a few tables around me weren't too keen when the tab arrived right after they got their entrees. Truly, though, I've never felt rushed. You pay at the counter whenever you're ready. By the time you turn around, there's another party sitting at your freshly cleaned-and-set table. The pace is particularly gratifying when you're starving. On a recent visit, literally minutes after ordering, the French Toast Foolishness ($7.95) arrived, piping hot. I consider a composition like this an ideal breakfast equilibrium of carbs to fatty proteins. It's two thick pieces of French toast, flanked with the Park Potatoes and two slabs of darkly cooked bacon. The two eggs cooked your way ensure you stay just shy of the inevitable sugar coma. Perhaps the "foolish" name comes from the way I felt after finishing the entire plate. But then again, that title could be the feeling I get whenever I decide not to order the dish to start a lazy day. 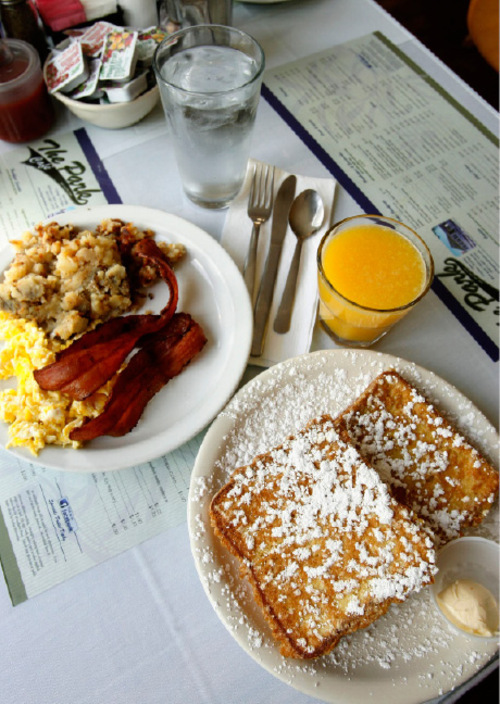 Regulars crowd this neighborhood café for straight-forward, ample breakfasts, brunch and lunch-like French Toast Foolishness, huge omelets, Michigan Hash and patty melts. Hours • Monday to Sunday, 7 a.m. to 3 p.m.